Can this touchscreen all-in-one do better than its brethren? All-in-one PCs should be a big success. By combining all the power and flexibility of a desktop computer into a slim and stylish form factor that included a monitor, all-in-one PCs such as the Asus Eee Top ET2010 and MSI WindTop AE220 could have been the Windows-based answer to the Apple iMac. Instead, they're regarded more as pale imitations that are underpowered, cumbersome and neither as desirable as an iMac or as robust as a desktop PC. The new Packard Bell OneTwo L enters this market with both an opportunity and a challenge: to finally be an all-in-one PC that is worthy of a space in our homes, be it in the living room, bedroom or study. But can it pull it off? One of the most common criticisms of all-in-one PCs is their lack of power. While their small form means that multiple graphics cards and overclocked processors are a no-no, it also means that upgrading components is a far more fiddly process than with standard desktop PCs. This means that they need components that are future-proof, so your new all-in-one won't seem out of date and slow only a year or so down the line. Gaming laptops such as the Asus G74SX prove that a small body doesn't mean it can't be incredibly powerful - for a price. Packard Bell's answer is to include some pretty decent specifications inside the OneTwo L I7526. The quad core Intel Core i5 2400S 3.1GHz processor is enough to handle pretty much all day-to-day computer tasks with ease, and 4GB of DDR3 RAM is ready to cope with multitasking. Sure, it won't handle the latest games like the Asus G74SX, but it costs nearly half the price. It's still not cheap by any means, though, so Packard Bell still has its work cut out to convince us to part with our cash. As the Packard Bell OneTwo L comes with a 23-inch touchscreen, it encounters another familiar hurdle - Windows 7 just isn't designed for touch interfaces. 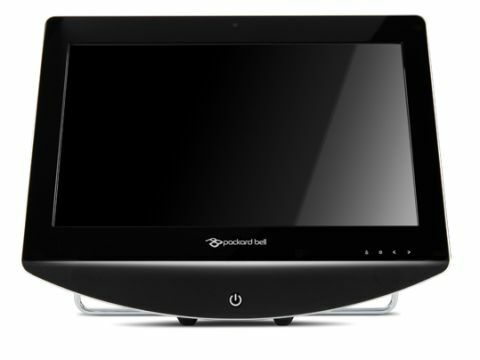 Packard Bell's solution is to create a new touch-friendly interface, superficially similar to Windows 8's Metro screen. But how well does it work?